The Printrbot Play is the spiritual successor to Printrbot’s long-line of low-cost models starting with the crowd founded Printrbot Original all the way to the more recent artisanal Printrbot Simple. In many ways, the Play is the culmination of half a decade’s worth of polishing and adjustment on the part of Printrbot CEO, Brook Drumm. 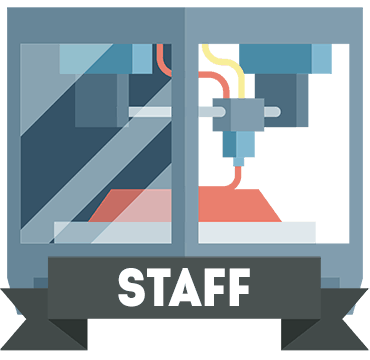 As an entry-level model, does it offer enough to tempt first-timers to the wonderful world of 3D printing? That’s a resounding ‘’yes’’ from us, but let’s look at it in detail. The aesthetics of the Printrbot Play aren’t the most refined and veer more towards a robust, functional look with Printrbot’s now customary aluminum frame and curved black/white powder-coated steel enclosure panels. The look is a little on the cutesy side due to the printer’s diminutive size, but the encased components give off a minimalist workhorse allure that suits this model down to the ground. 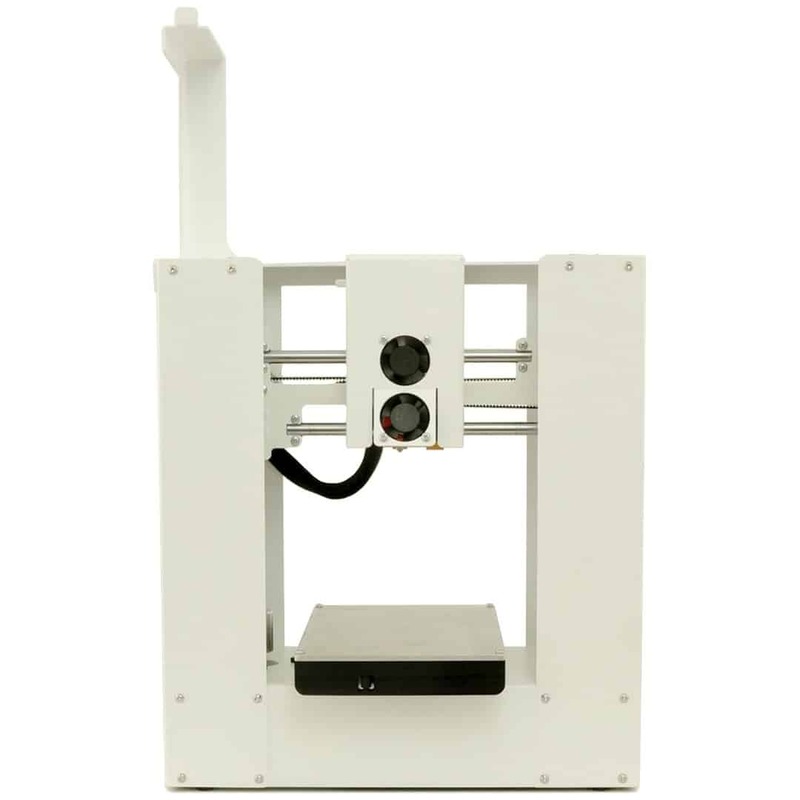 In tandem, the semi-enclosed design offers a degree of safety, and it even has a fan shroud and extruder cover to protect probing hands from the hot end and mechanical parts. The gap in the casing facilitates monitoring a print job and removing a finished print. The printer is sturdy but not unduly, and the small footprint is ideal for those with limited space. A set of four rubber feet on the base frame are also a welcome addition and do wonders for a sturdy motion platform in the face of natural vibrations caused by extruder movement. The base frame itself is one piece for added stability. Design-wise, the Printrbot Play is cost-efficient; every component is optimized to offer the maximum bang for your buck, without falling in the chasm of subpar quality. Printrbot tried to provide an affordable printer with all the performance of a premium equivalent and did so by choosing parts fit for that purpose, but without any added extras or functionality. It’s economical, and every piece has a defined and crucial role. At 100 mm x 100 mm x 130 mm, the build area is on the smaller side of the scale, although very much in keeping with the beginner-friendly credo of the whole package targeting the entry-level and educational markets. If you do want to try your hand at larger prints, scaling down models to fit the build area is an option as is printing pieces individually, then combining them afterward. As a fused filament fabrication printer, the Printrbot sticks to the Cartesian design with stepper motors guiding the single extruder on the X and Z axes along two metal threaded rods, while the plate shifts on the Y-axis thanks to 8mm precision rods bolted to the frame. Layer resolutions reach a respectable 100 microns, which is uncommonly detailed for the price range and a delicate balance between speed and quality. 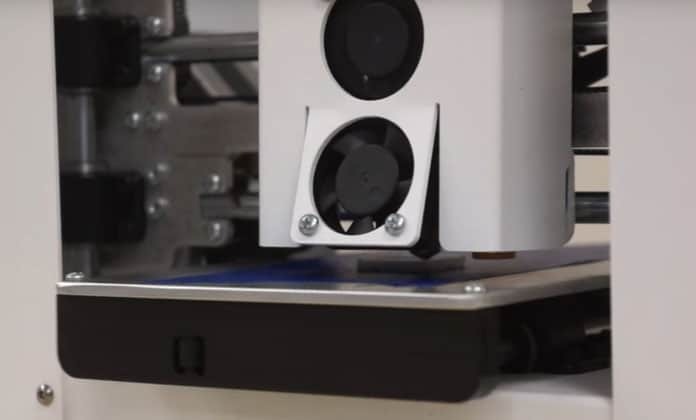 Because the build plate is made of a thick layer of aluminum and bolted onto the moving parts, the Play’s auto-leveling bed probe makes all the adjustments meaning there’s absolutely no need for user-led calibration. The probe only really works to level the printing surface when the printer is set down on an uneven surface. As the Printrbot doesn’t have a heated bed, it’s suited to 1.75 mm diameter PLA, Nylon, and flexible or experimental filled filament. 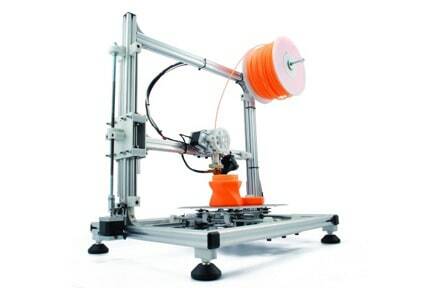 The filament sits on a top-mounted filament spool bracket to save space. 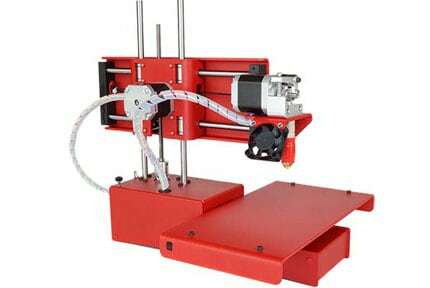 The hot end is made by Ubis, who is renowned for quality, while the extruder is of the spring-loaded direct-drive V2 variety. The dual fan setup works well with one angled towards the print job, and the other aimed at the extruder. The Printrbot Play connects via USB or an SD card for untethered printing (after initializing first via USB). A Wi-Fi connection would have been a nice addition, but the cost of implementing it would have seen the price skyrocket considerably. The lack of Wi-Fi is, therefore, another measured engineering decision. The SD card solution is as simple as can be; load up a .gcode file to the card, insert it into the slot on the printer’s side panel, then plug in the power cable. 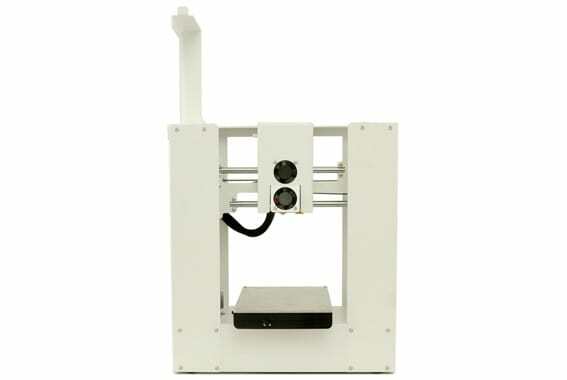 The hot end heats up, the printer’s auto-leveling probe calibrates the X, Y, and Z axes, then it gets to work. We did find the lack of an on/off switch a little bothersome, but once again this is a cost-saving feature and using a power strip with a switch provides virtually the same functionality. The Printrbot Play doesn’t ship with proprietary slicing or printing software in keeping with the open-source ethos, but Printrbot does recommend the versatile Cura software that runs on Linux, Mac, or Windows for slicing, and Pronterface to interface with the printer. The firmware is classic Marlin so no surprises there. As the Printrbot Play is no longer in production, chances are you’ll get your hands on a pre-assembled model as we did. The packaging is well-designed and minimalist, yet with enough protective styrofoam to keep the device well protected. The extruder and build plate are restricted thanks to cut to size inserts, which also need removing. Unlike many ostensibly pre-assembled entry-level printers, the build plate comes fully fitted. Only the spool holder needs setting up, which involves removing three screws on the top casing frame with the Allen keys, lining up the spool holder, then replacing the screws. 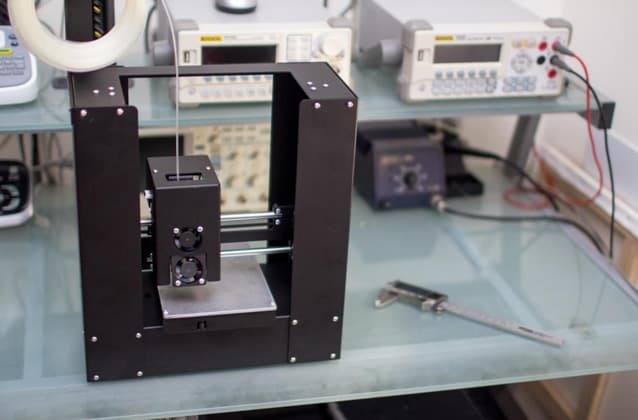 The package includes a 3D printed test cube, pre-assembled printer, power supply with brick and power cable, USB cable, a filament sample, spool rack, a set of Allen wrenches (2.5mm and 2mm), an SD card, and a 1 mm spacer. Where setting up the Printrbot gets difficult is loading the filament. The system isn’t the simplest by any stretch of the imagination and is the one negative we could found. The extruder shroud needs removing to get a good view of what you are doing. 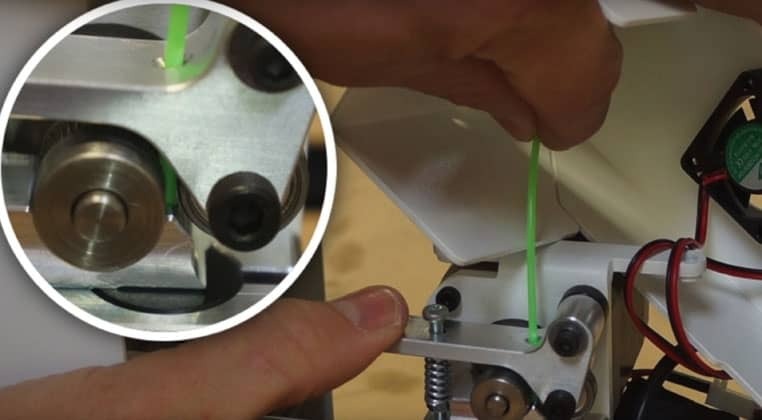 Next, the filament needs feeding through the gap in the shroud then edging towards the hole in the extruder handle while simultaneously pressing down on the handle to loosen the feeding gears, all the while aiming for a smaller gap on the extruder itself. The procedure isn’t overly complicated, but instead fastidious and takes practice to get right. After a few filament replacements, it becomes easier. 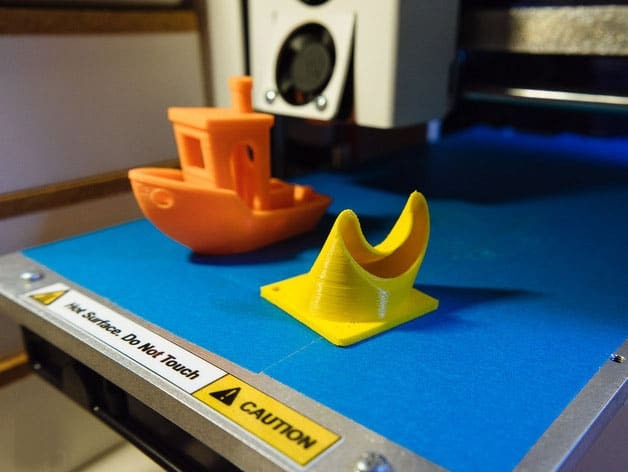 Once you’ve connected the USB cable, powered up the printer, downloaded and installed Cura, then configured the printer with the Cura Wizard, which has a Printrbot Play option to make things easier, you’ve finished setting up the printer. For its size and price tag, the print quality is nothing short of incredible. Compared to other printers on the market, the Printrbot Play rivals the prints of models priced in the thousands of dollars. Pretty much anything we threw at the printer in PLA came out great from complex contours, to highly detailed surfaces, by way of intricate patterns. Overhangs weren’t as perfect as they could be, but then again for a novice printer, it performed more than admirably. The calibration is more or less flawless, and the only real adjustment was to add a layer of print bed or blue painter’s tape to the build plate. The tape adds a bit of grip and a tad more temperature control. Other materials do require some tweaking to the extruder tension and having to remove the shroud to adjust this can get frustrating. Additionally, the cover itself blocks the print job for the first few layers meaning you can’t monitor the print from the get-go. The Printrbot Play is fast for its size and does so without a hit to quality, with very few imperfections, blemishes, or layering issues. It’s a little on the loud side, especially for such a small unit, but nothing that will keep you awake at night. The reverberative properties of the open casing format have a lot to do with the extra noise we experienced. Support is where the Printrbot Play loses the most points. Printrbot sadly seized operations midway through 2018, and the Printrbot Play is no longer in production. The Printrbot website used to be a useful resource full of tips, guides, and support articles, but now redirects to Ubis’ site, who has vowed to continue producing the hot end used on the Printrbot Play for the foreseeable future. The Printrbot YouTube channel still exists, showcasing a selection of walkthroughs from maintaining the Printrbot Play to modifications guides. There’s also a lively community of Printrbot Play enthusiasts over on Thingiverse who can help with questions and provide getting started, help, and support documentation. As for warranties, refer to the point of sale for more details. With Printrbot now defunct, don’t expect any after sales support from the manufacturer. The minimalist design, the sturdy frame, excellent print quality, and the low price mean the Printrbot is one of, if not the best, sub-$500 entry-level printers available. The Printrbot Play is one of those 3D printers you can turn on for a print and leave to its own devices for a few hours knowing it will do the job well without supervision. The only real downside is the shroud, which is an inconvenience, but we found we could work around it regardless. As for the lack of support, it’s a gamble, but if we were to pick a non-supported printer to go for, then we would choose this one every time. Belying its small size, the Printrbot is hands down the best affordable 3D printer available and is ideally suited to first-timers who want a reliable model that produces quality prints every time.